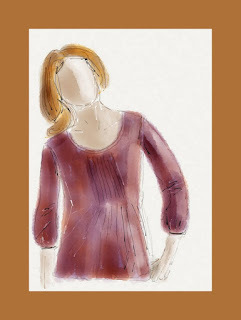 Another little top from the Autumn 2008 in the Boden catalog - one which I've worn many times. I find it quite liberating, to draw these figures without faces. Drawing the human face is hard, it can ruin a decent drawing. So this is the perfect solution for me. Hopefully it will help me build confidence in my drawing skills, and some day, I will be able to draw a face easily. That said, I did a self portrait once, and I was really proud of the result. And also a portrait of BB, which is a good likeness (except his beard was longer then). Practice Practice is what it's all about, and good technique. Maybe when I'm finished this series, I'll dig up Drawing on the Right Side of the Brain and focus on faces - or maybe not! 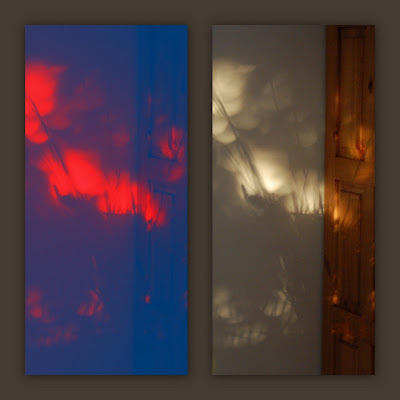 Another one from the Autumn 2008 collection. It must have been my favourite season of all times. 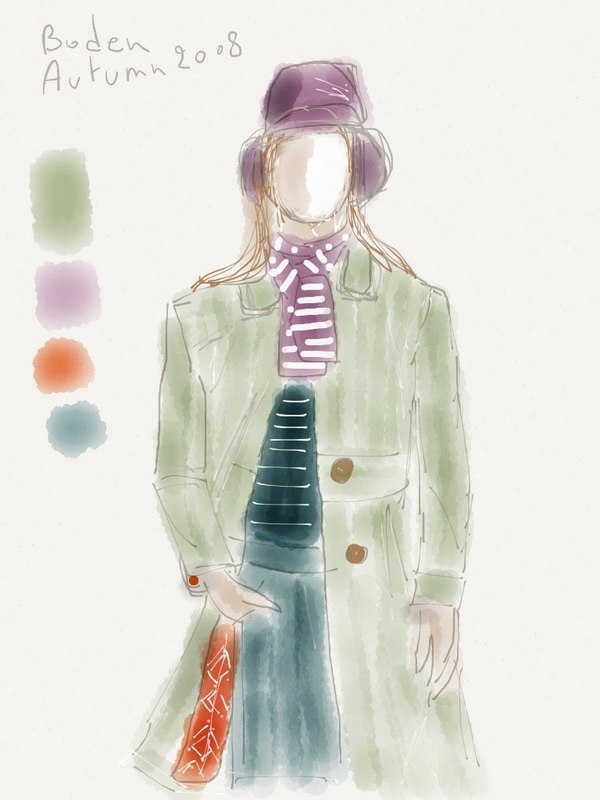 As I go through the pages, I'm finding so many outfits I love. This one is a shirt and tank top, which I still wear on a regular basis. They look as good as they did on the first day. I think I ordered this coat, but returned it, as the colour was all wrong for me (the actual colour is more yellow green than this drawing). Still love how it looks on the model, though. 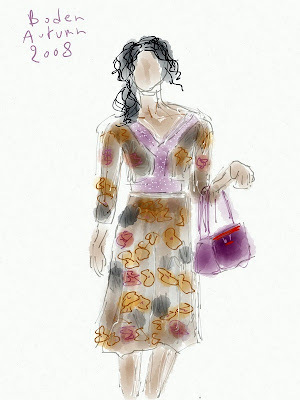 I loved this dress in the Autumn 2008 Boden catalogue. So sophisticated. But I've only worn it a couple of times. I think the problem is that I'm not tall enough to carry that busy pattern. I can't part with it, though. I must try it with high heels. 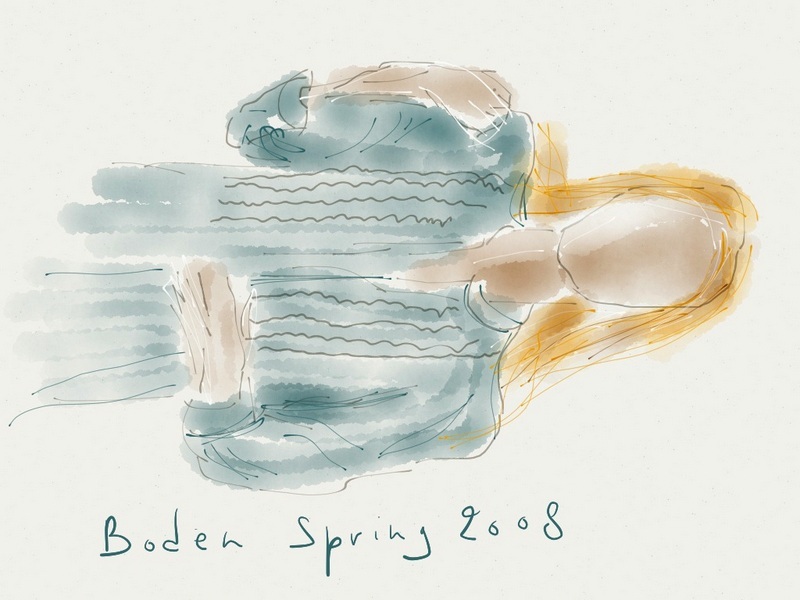 And in case you're wondering, yes, I still have the Boden 2008 catalogs on a shelf in a hidden corner. You see, I knew they'd come in handy some day! Evelyn Cusack, with her usual sparkly-eyes smile, even when the weather is not good. She's been wearing some nice dresses lately. And she's been experimenting with new hair styles, which must be a major departure for her. Looking good! 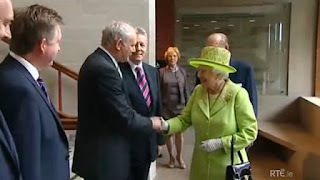 Big day today - Martin McGuinness shakes the Queen's hand. Never thought I'd see it in my lifetime. Who would have thought that we'd see the former head of the IRA shake hands with the British Monarch. I think that's a fantastic day for the world. It shows that the past can be the past. This shirt is another one I bought from the Spring 2008 Boden collection, and I got great wear out of it - a long linen shirt with a small frill at the front. Perfect with jeans for a night out - not too formal, not too casual. It's well worn now but I can't bring myself to get rid of it. 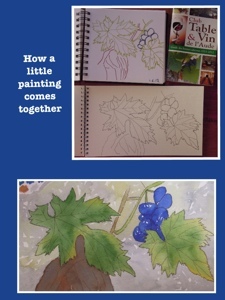 PS: I didn't forget to rotate my drawing - the photo in the catalog is of the model lying down on the floor! 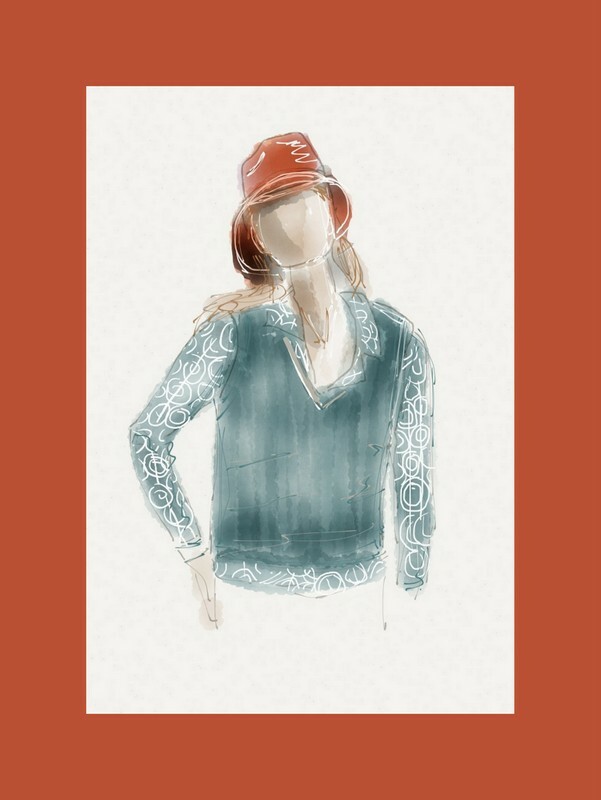 I find the MadeWithPaper section of the FiftyThree website quite inspirational - such beautiful drawings. I've now signed up to Tumblr and I'm following a few of the artists promoted on the site. I'll never be as talented as some of these guys, but that won't stop me trying. The drawing below is a navy merino wool tunic, worn with a white t-shirt and white cami, featured in Boden's Spring 2008 collection. I actually did buy the tunic at the time, but never thought to wear it with white trousers. Next sunny day, I'll give it a go. This is a little vineyard on a hilly corner near Montséret. 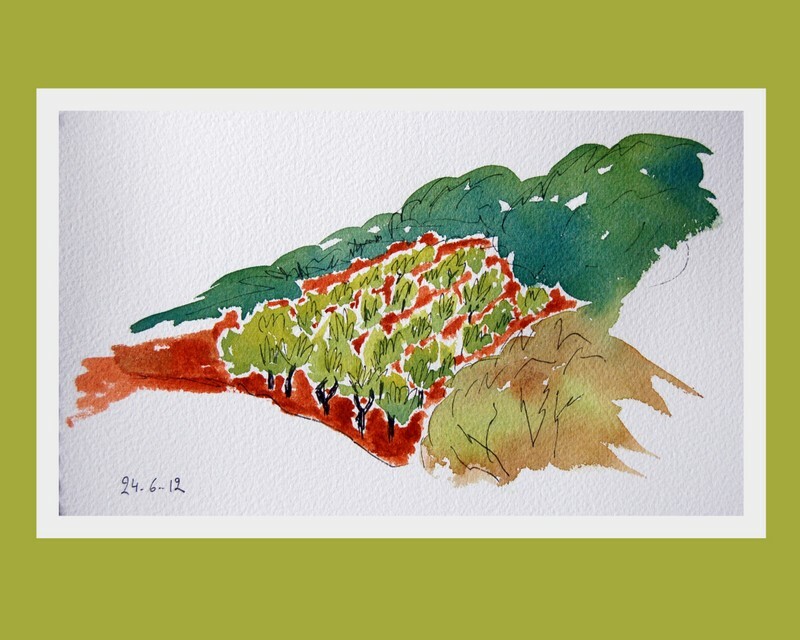 There are lots of roads criss-crossing the countryside around that area of the Corbières, and we spent the second week of our holidays exploring them. We saw lots of green lizards (about 30-40 cm long) sunning themselves on the stones on the side of the roads, and a few crushed ones too, I'm afraid, those that discovered that the tarmac surface is nice and hot, but who didn't learn in time that passing cars can mean sudden death. 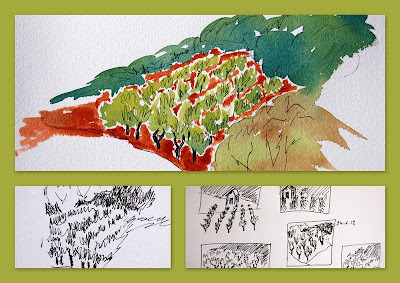 I did plenty of little sketches on our walks while holidaying in the Corbières. The weather has been so bad since we got back by the way that I'm ready to hop on a plane and go back there, where the temperatures are showing 27-28-29-30, compared to our current 11 in Dublin. The weather in Ireland never got to me before, and I've been here since 1986. But we seem to be getting nothing but grey skies. 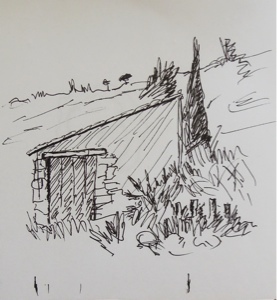 So I'll leave you with blue skies over a farm shed. 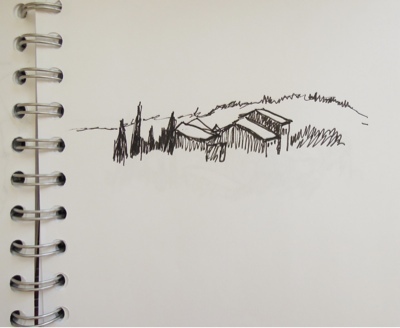 This one is a big shed compared to my previous one, so I drew it more like a house. By the way, I found out that they call them - mazets, a lovely word, full of sunshine, the sound of the cicadas, and the taste of rosé. Unlike this word, which, to me, doesn't evoke dancing with umbrellas, pink wellies, jumping in puddles, or even happy dogs: báisteach! 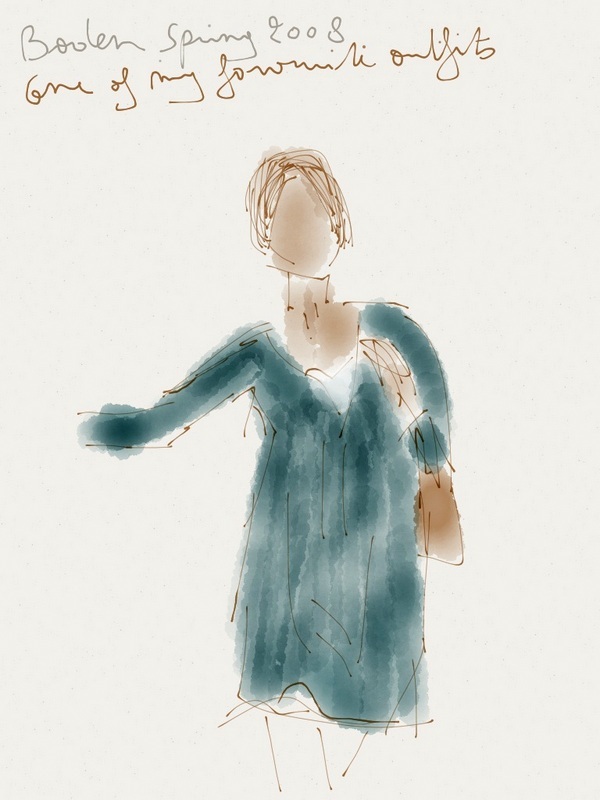 Made with Paper, and inverted colours in Picasa. Maybe I should try an acrylics version? 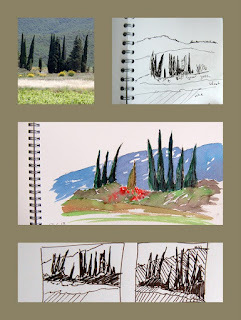 I've created a new label in my blog, for "Made with Paper" pieces, as I'm using Paper quite a bit for doodling. One thing I loved in France was those big long radishes, lovely as a snack to munch on with a glass of wine! The first time I had them was at Susanna Linhart's house, and I was delighted to find them in the Intermarché in Lézignan-Corbières. 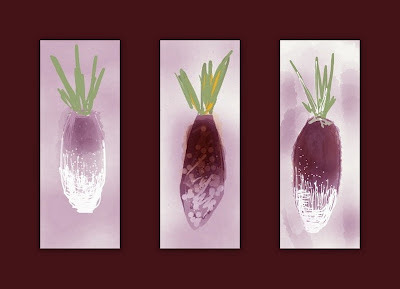 They became a staple of our 5-o'clock apéritif, with a dash of salt, or on their own. So I had to draw them, not very well, I'll admit! 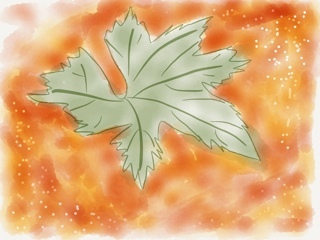 If you're looking for technique ideas and inspiration for using Paper, check the MadeWithPaper section of their website. We've just barely finished the last episode of Entourage Season One and we're already on the second DVD of Season Two. Some evenings, we'll watch two episodes in a row - they're less than half an hour each, but yet, they're packed with action. An exciting experience, finding a series we both like. 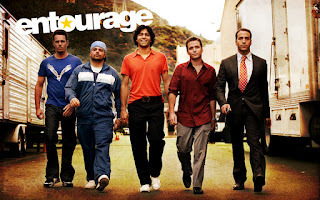 As we go through box sets and Netflix at a fast pace, it's hard to find new stuff, and I'm delighted to know that there are eight seasons of Entourage to look forward to, and a possible feature film! As usual, I'm years behind in discovering these things - Entourage ran from 2004 to 2011! - but hey, that's never stopped me before! It's got a simple premise - 4 lads are living the life in Hollywood. Vince is a young up-and-coming actor, Eric is his friend from school, Johnny Drama is Vince's brother, also an actor, but not quite so successful, and Turtle is their friend too, not sure if it's from way back when they were growing up in Queens or at some other stage. But anyways, they're all friends and we're following their life in Hollywood, the girls, the drugs, the movies, the agents, the directors, the publicists, the beach parties, the best tables in all the restaurants, the nice cars, the tickets to U2 concerts, and the ongoing uncertainty about the next job. Vince is a charmer, he's very easy-going. Eric becomes his manager, he's the one who worries about the money, who takes the calls, who makes the calls. Johnny is auditioning for small parts in TV pilots, and he cooks for them all. Turtle does the driving and the general bits and pieces. All likeable lads. Then there is Ari, the agent, the wheeler dealer. But it's not all rosy. There are tensions. There is an underlying grittiness that appeals to me. Hollywood is a dreamland, but it's also full of gossip and competing actors and agents. For a list of celebrity appearances, check out this Wikipedia article. Went to see Prometheus yesterday afernoon. Not a bad way to spend a Sunday afternoon, but too many loose ends for my liking. 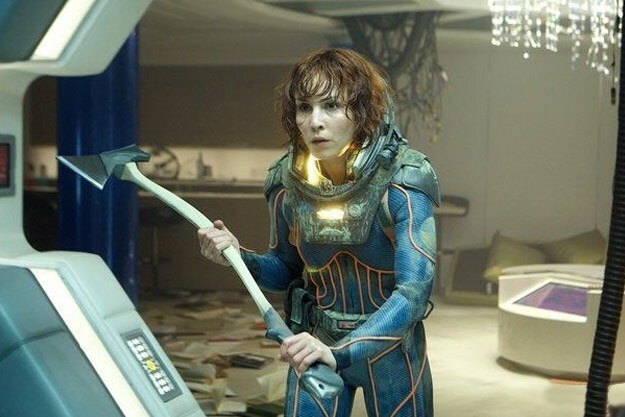 Maybe, Ridley Scott would have needed a couple more hours to tell the story properly - in which case a Director's Cut release will solve all of this for me. I was expecting a jump-in-your-seat Alien-like movie, but there weren't enough dark corridors on the spaceship for that (see picture to the right - there is even a chandelier! and the spacesuit is colour-matched with the door panels). I know, I know, it wasn't intended to be a repeat of Alien, but I found the story told in too straight a line. Speaking of straight lines - when the human spaceship picks a place to land on the planet, they seem to do so at random, without aerial mapping first, and then the first thing they see is a big straight road leading to a big intriguing mound. Yes, a straight road is certainly evidence of intelligent lifeform - but nobody even asks where is the road coming from. And also, aren't they so lucky to have come across this yellow brick road, of all the places in all the world, they had to come to this one! There is an interesting android, David, but we're not finding out enough about his motivations to understand his actions - Why does he feed the cute scientist guy some DNA that will most likely kill him, and does he know that at that particular point? (And by the way, why does cute scientist guy decide to get drunk as soon as he's found evidence of the life form that created man - ok, that lifeform is dead, but there could be others alive somewhere else on that planet?) Why does David want cute scientist girl (Noomi Rapace) to carry her monster baby to term? And come to think of it, why does she not go around and tell everybody what David did, once she's managed to remove said monster from her belly, using a self-controlled operating theatre that looks like the crane game in an amusement arcade, the one where you can never catch the cute teddy bear that's sitting in the middle of a dozen other cute teddy bears, all equally uncatchable? You get my drift - I don't mind questions remaining unanswered in a movie, or a director keeping us guessing. What I mind is protagonists who seemed to have been picked out of an actors' casting interview for this most important space mission. All decent actors, but none of them convincing me that they are serious scientists and space explorers. If it hadn't been for the rain, we would have been better off going for a walk instead. I painted this watercolour today, using a quick sketch I did on one of our walks around the countryside in the valley that extends between Montséret and Saint André de Roquelongue, between Pradines Le Haut and Le Coude. As you can see, it wasn't much of a sketch, but it's amazing how the act of drawing on site imprints a picture on your brain. It also helps to take a photo, of course, but a photo on its own isn't enough. 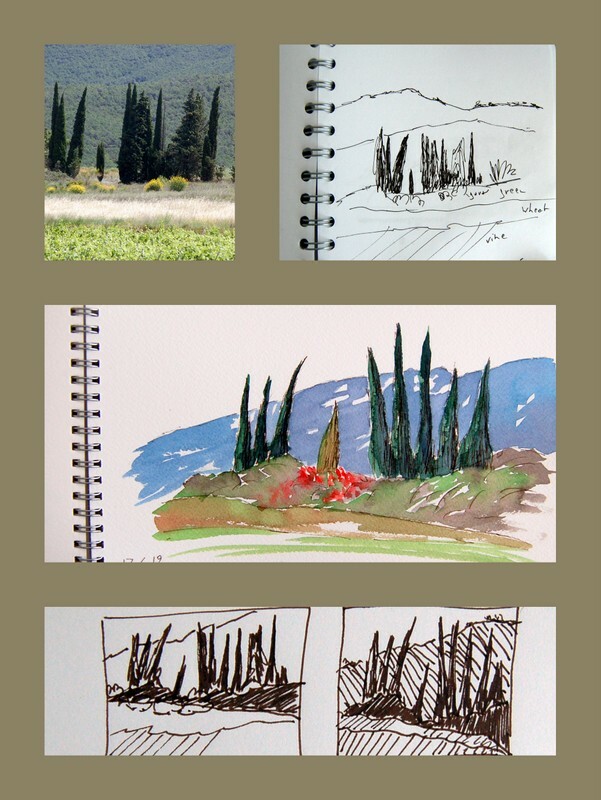 I must try out a few more paintings based on these sketches, though I have to say I don't feel the same enthusiasm now that we're back home. Is it the lack of sunshine? Or that my paints are drying so much slower here (no heat, no wind)? 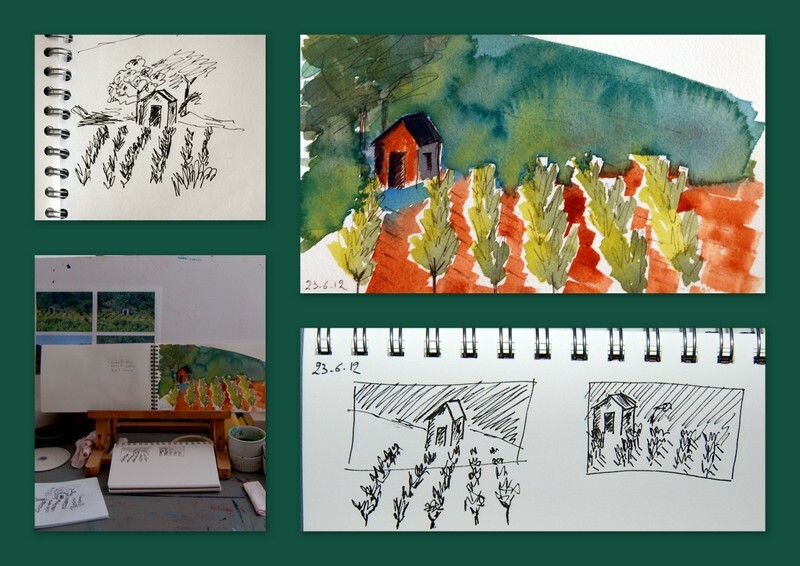 Or that I'm back to using my standard set of watercolour paints, rather than my Derwent Aquatone limited palette, which is full of bright colours? PS: I couldn't find the exact location of where I took this photo on Google Maps - there are a lot of interconnecting roads in the area and my patience is not infinite after all. But while looking, I found my little shed, so I thought I'd share it with you! A "reworked" photo of the Pyrénées from a hill near Saint André de Rocquelongue. You'll only see the Pyrenees on a clear day, and even then, it's so far in the distance you can not be sure where the mountain ends and where the clouds begin. We must go there in the winter some time to see what it's like. Murakami's 1Q84 has probably been debated to death a million times over. But that won't stop me, surely! It's a complete puzzle, of course, two journeys that start miles apart, with no obvious connections, and slowly become intimately intertwined, with lots of detailed side stories and descriptions that add to its richness along the way. And there is the whole 1984 thing too, half of which is most likely lost on me. Maybe I should watch the movie again? I read the book, but it's such a long time ago, when I was in college. And I probably didn't get half of it anyway. I loved the whole feel about the second moon - it reminded me of the movie Another Earth. There is this eerie tense calm and sense of mystery that seems to emanate from this new celestial body. 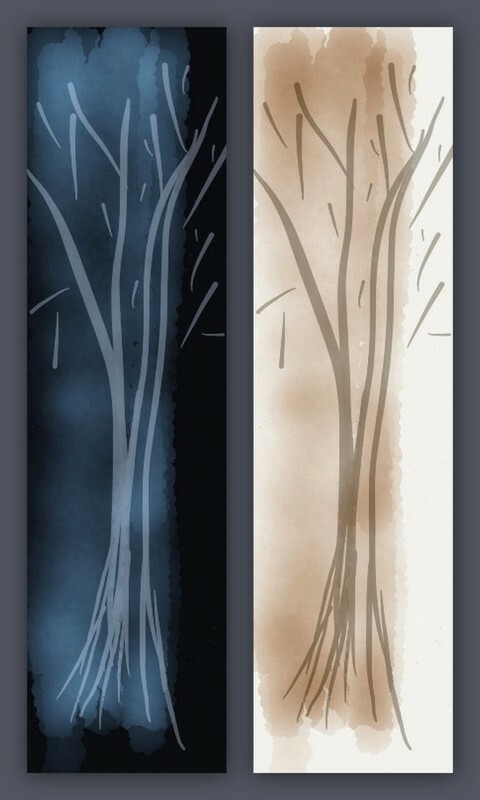 Bottom line for me, though, is: 1Q84 is a love story. For the first three hundred pages or so, it doesn't look much like a love story, I'll admit, but that's what it is. Apparently, I'm not the first person to have figured that one out. But I didn't know that when I started reading, so I'll take full credit for this earth-shattering discovery! It's a big book - 624 pages for Books 1 and 2, which I've just finished, but really satisfying in its complexity and in the heart and soul of its main protagonists. I can't wait to start Book 3! Its English translation is by another translator, though, which is strange. Why change translator two thirds through a story? Maybe he wanted a different feel for the third chapter? Or maybe the original guy wasn't available? Or wanted more money? Who knows? Which brings me on to a question I have - the characters eat in cafés or cook their own food, but it's often Western food, an omelette or a croissant with a cup of coffee, for instance. I just wonder if this is in the original Japanese text or did the translators adapt the food to make it more universal, less quirkily Japanese? Is it a case that the youth in Japan eat very similar food to ours, and did so already in 1984? 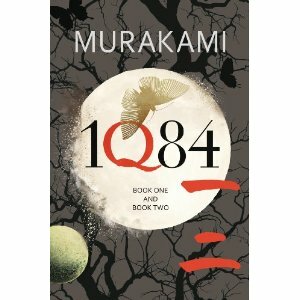 PS: here is another link to a Murakami website - the first one doesn't seem to have any references to 1Q84 - maybe it hasn't been updated recently? This one is visually interesting, if nothing else! Well, the official website is probably this one from Random House. Very fancy, with music and all. This is really the one to go through for all you want to find out. I have glimpsed over the Translation section, but I haven't found answers to my questions yet - but I'm only on page 2 of the Translators' Roundtable! Another question I have after looking at the website- is Murakami a cat lover? He wouldn't appear to be from reading the book, but the website imagery seems to imply otherwise. I bet he is! Jean Byrne was even sexier in this sleeveless pink dress last night! 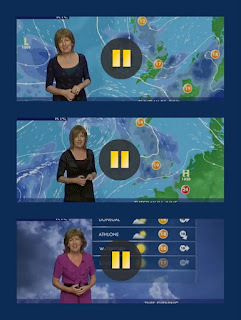 Lovely sleeveless dress for Jean Byrne this evening, satin or leather, I'm not sure. But what I'm sure of is that the boys on the forums will love it too. 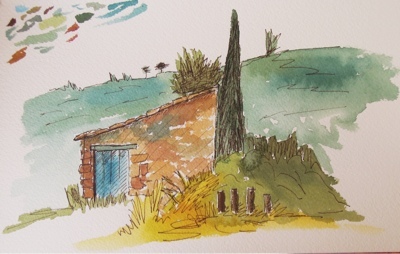 Another little painting based on a sketch done while out walking. 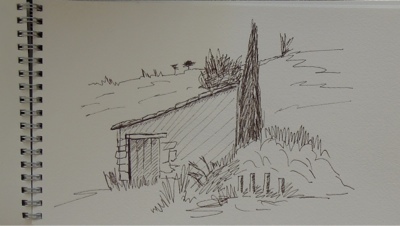 I sketched this little shed while on a walk. When we got home, I redrew it on watercolour paper (Arches Travel Book, 300g/m2), with more accurate proportions (though, when I look at the photo I took, still not right). 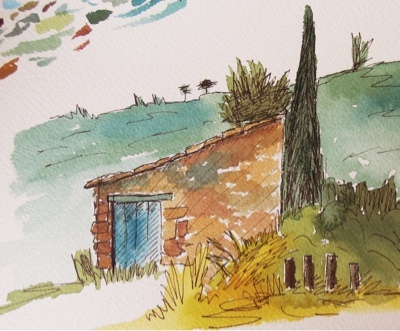 And then I painted it in a limited palette with my Derwent Aquatone watercolour pencils. The composition isn't great, so I've cropped it square. I must print those out and compare them side by side. I can't remember where I had heard or read about The Twelve. 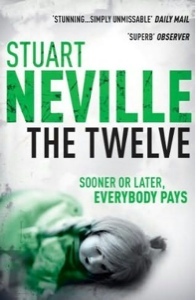 But the review of Stuart Neville's book had caught my eye all right. As always, I have quite a backlog of books to read, so I only got to it last week. It's not my usual kind of book. It's a violent thriller story after all. But it's set in Belfast in recent times. The ceasefire is holding, Sinn Fein is in government in Stormont with the Unionists, the Odyssey is the centre of Belfast nightlife, the North is now at peace. But is it? Are all the men of violence happily retired? Have they all become angels, tirelessly working for peace? Gerry Fegan, an IRA man with twelve deaths on his conscience, might be about to change everything. Quite a page turner. I couldn't put it down.